"such a serious young man"
Anyways, yesterday was a mess so i'm once again doing most of the work on todays comic... today. :P Not sure when i'll be done, but i'm gonna opt for doing a nice job rather than rushing it. 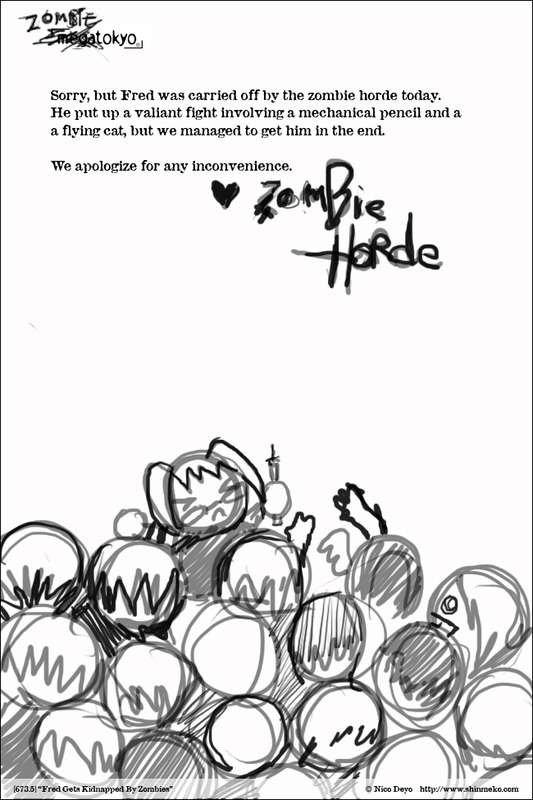 Till then, enjoy the message from the zombie hordes. I've discovered that there are some soundtracks I just shouldn't drive to. Seriously. I'm the kind of person who's enough of a toe-tapping sucker that when I play Tomoyasu Hotei's Battle Without Honor or Humanity on my MP3 player, I start walking in rhythm with the bass line. Which, of course, means that I must never, ever put any of my Hotei CDs in the CD player whilst I drive, with the possible exception of King & Queen, which is a swingier, more big bandish album, rather than his usual guitar stylings. Unfortunately, the "no hard rock, metal or techno" rule I've enforced on myself leaves me with a limited selection while I drive... which actually leads to a funny story. So about a month ago, I was driving my mother to the cemetery for the one-year anniversary of my grandfather's death, and, looking at my collection of various anime and video game soundtracks, I tried to figure out what my mom, who listens exclusively to Vietnamese pop and hymns, would not mind playing. So I stuck in the Mai-HiME soundtrack, crossed my fingers, and drove down to the cemetery. She seemed lost in thought for a while (understandable; it's been a long year since her father died), and then she turned to me and asked "I really like this CD, what is it?" Since my family has a long-standing prejudice against the Japanese (that's what happens when you grow up during World War II in Asia), I just left it at "it's a soundtrack, Mom". But hey, who knew? Parts of Mai-HiME's soundtrack sound enough like church music that it gets my mother's seal of approval. Heck, she had me copy the CD for her so she could listen to it. Isn't that weird?